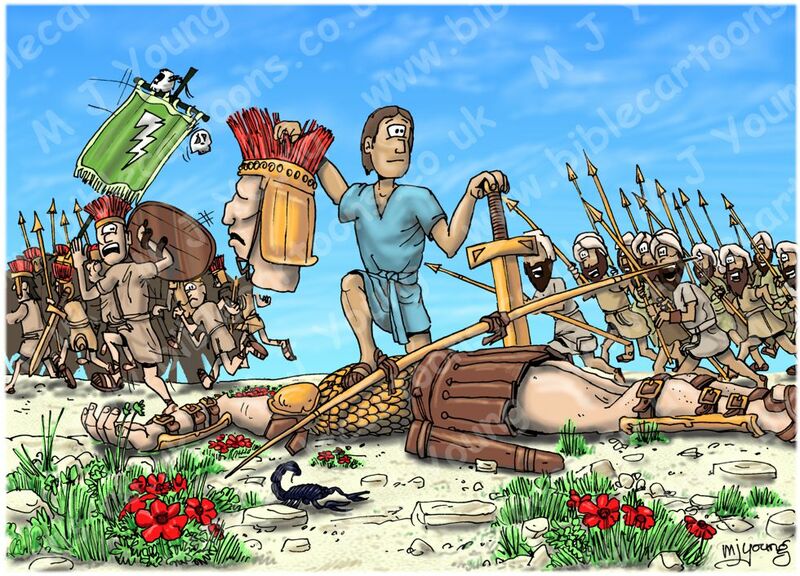 50 So David triumphed over the Philistine giant with only a stone and sling. 51 And since he had no sword, he ran over and pulled Goliath’s sword from its sheath. David used it to kill the giant and cut off his head. When the Philistines saw that their champion was dead, they turned and ran. Clear sky – overhead sunlight. 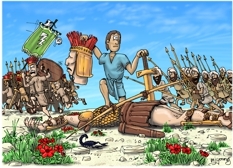 Goliath (dead), David (standing over him), the Israelite army giving chase to the Philistine army. Red flowers = Anemone coronaria, the Crown anemone or windflower. I decided not to draw blood coming from the beheaded Goliath, but use these flowers to represent his blood. The scorpion is Androctonus crassicauda, the fat tail scorpion, whose venom is very powerful. I just decided to draw it for interest! All artwork, pictures and contents Copyright © 2013 - 2019 Martin Young.